Another site another shopping spree – lol! I had gone to Inglot store to pick up my free gift and decided to pick up some cosmetics as well. But they did not have a nail paint I liked plus they would not let me buy something from the Freedom System without showing them my palette. I have a palette but not from Inglot. So I decided to try out the site to see if I could find the products I wanted. As some of you would know Major Brands brings a lot of the big names to India. 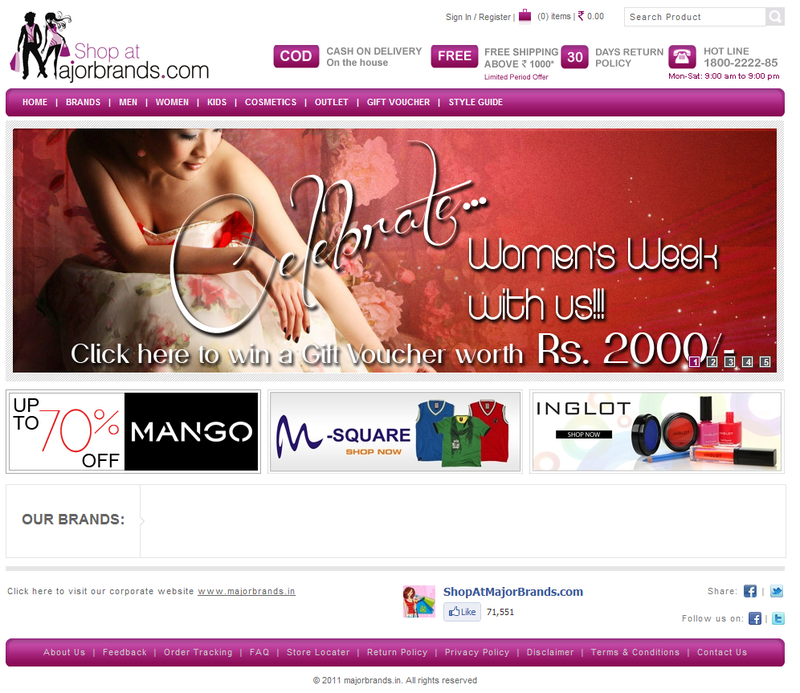 Mango, Alcot, Inglot, etc. all are part of its umbrella. The site is well laid out and easy to navigate. Inglot’s page is categorized properly making it easy for you to find the product that you want. What I did not like was that all the cosmetics that you could find in the store are not available on the site. For example, Inglot has a crackle nail paint collection which was not present on the site. The newly launched eyeshadow square trio from the freedom system was also missing. Anyways they have a credit/debit card option of payment along with the COD method. I did not find the eyeshadow trio that I had seen in the store but did manage to get the nail paint I wanted and picked up a few other things. I picked up a pastel nail paint in 969 (Rs. 490/-), Lip Duo lip gloss in 45 (Rs. 720/-) and an eyeshadow refill pan from the freedom system in 467DS (Double Sparkle) (Rs. 300/- for 1.8 gms). I choose the COD (Cash On Delivery) option. My total came upto Rs. 1510/- with free shipping. I placed my order on 29th Feb and got a call from them to confirm the order the next day. They shipped my order on the 3rd of March which was a Saturday. I got my order by the 5th of March. Personally I feel that this process took a little too long. I should have received my order by the 3rd. Some of the other sites are really quick in order processing. They did mention that they would call up their stores to confirm if the products I had ordered were in stock. I felt this to be a little weird. Anyways I got my package and really like the fact that they packed the cosmetics in a small plastic box which was then wrapped in bubble wrap to prevent the glass/plastic for the cosmetics from breaking. Well I’m not going to say much about the products here. You would have to watch out for upcoming individual reviews for them. So until next time ladies! Would you purchase from this site again? – Yes. It is the only only place that you can buy Inglot products from apart from the stores in India.